Two months ago I started a thread on our Facebook page asking for suggestions on keeping your apartment warm in the winter while reducing energy bills. 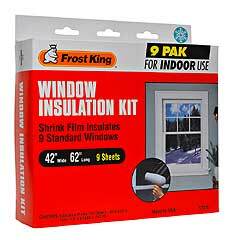 One of our readers, Arlinda, wrote in suggesting Frost King's window insulation kit (starts at $4.98 at Home Depot) It's a clear film that you apply to your window frame with double-sided tape. Frost King blocks drafts and the cold from the window glass by trapping it in the pocket between the window and the film. At first, I had reservations about putting an ugly plastic film around my windows. How tacky! But with drafts coming in through the large windows right above our living room couch, I had to do something before I froze to death watching TV! So I bought the kit, then kept it unopened in my office for over a month. I'm lazy like that. So far, I love Frost King. It's clear enough, you really can't tell it's there. Plus it was easy to install. You just attach the included double-sided tape to your window frame, apply the film, and use a blow dryer to remove any wrinkles. So far the only issue I have is covering the sides where the tape may show. Window blinds or curtains should do the trick.We no longer feel any drafts and you can now sit and watch TV without freezing. I can't speak for the energy bill savings yet since it's only been a few days but our upstairs neighbor uses it on most of his windows and said his bill dropped $100/month for a 1-bedroom apartment. Great return for an easy to use product that only costs $7! If you go to Amazon, you'll see lots of negative reviews complaining about the tape's tendancy to peel off the window frame. Everyone seemed to suggest using 3M's mounting tape instead. Again, I've only had my tape up for a few days so I can't speak to it's strength yet but it might be smart to grab a role of 3M just in case. 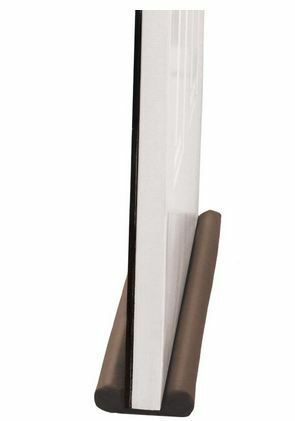 You can also try the 3M complete window insulation kit which got good reviews. Another thing to remember is caulk. If you have drafts coming in around the actual window, apply the caulk BEFORE the window film. If you have drafts between the trim and the wall like we do, apply the caulk there. We used DAP Dynaflex 230 ($3.74 at Home Depot). It's another easy to use product....just squeeze it out of the tube and run it along the crack. It's also paintable so once you're done you can go over the visible part with a brush so it blends in with the wall. Make sure to buy the smaller 5.5oz so you don't have to use a caulk gun. It should be big enough to do all your doors/windows. To stop drafts at your doors, try a double draft dodger. It slides under your door and blocks drafts from coming in. We had them back in Boston and they worked well on our interior doors that led to the common stairs and the laundry room. We bought one again for this apartment and found that it keeps getting caught on the metal bottom plate. I'd suggest this only for interior doors leading to garages, unheated rooms, etc. since it's not a super efficient solution. You can also buy them/cut them to fit windows, however when we tried this it didn't work. There wasn't enough slack between the tubes to go underneath our window. Again, I'd recommend caulk and window film as a more efficient solution. Before we go, don't forget to take a look at our roundup of space heaters under $100. What are your tips and tricks for keeping warm in winter?